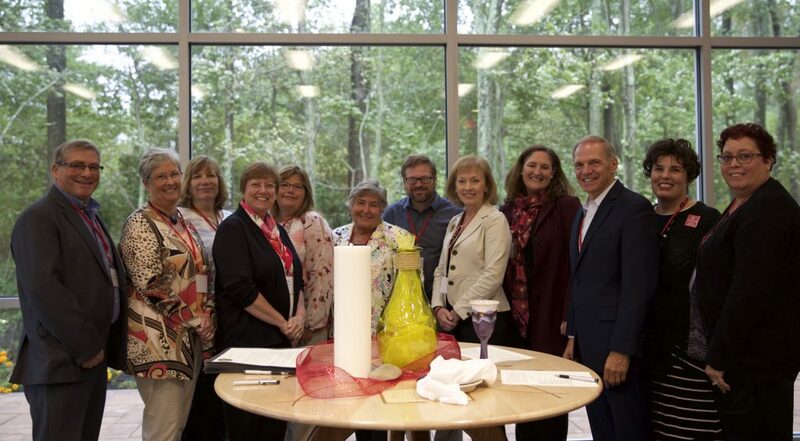 Ten GNJ deacons took the next step in their life of faith on September 29 when they gathered at the Mission and Resource Center to have conversation with Bishop Schol and Superintendent Steve Bechtold and to sign a covenant for presiding at the celebration of the sacraments. Regarding Holy Communion liturgy, Bishop Schol said, “It’s about drawing the congregation into something we speak together. It’s about drawing deeper into God’s grace and our relationship with God.” Schol reminded the deacons that we come to the Communion table humbled but with a lively and illustrative liturgy. The covenant states that deacons will hold each other accountable to their ministry and the covenant they were making – the faithful administration of the sacraments, report annually to the gathering of deacons and the charge conferences to which they relate about their ministry of extending the mission and ministry of the church, including presiding over the celebration of sacraments. It also states that deacons are to work in cooperation and collaboration with any elders appointed to the same ministry context as the deacon in assisting the administration of the sacraments. For the deacons gathered to sign the covenant, the moment was powerful and moving. Schol stated that the sacraments were a mystery we can’t fully explain. “We need to leave room for that mystery,” he said.